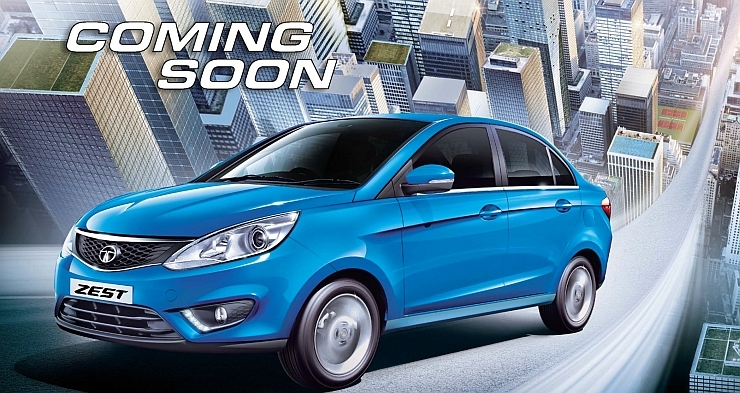 Interested in the soon-to-be-launched Zest compact sedan from Tata Motors? Well, the Indian automaker will offer a “priority test drive” for you. To register for the same, you simply need to SMS “MYZEST” to 5616161. The new car is due for a launch in India, in the coming weeks. Based on a tweaked X1 platform, The Zest is a car that Tata Motors is banking on, to boost its sales and help it reclaim market share, which has been steadily dwindling over the past couple of years. A lot of technology has gone into the Zest compact sedan, to make a class leader in terms of features offered. The Zest compact sedan, which is a sub-4 meter offering, will b the first Tata car to feature a turbo petrol engine. The automaker has readied up the 1.2 liter-4 cylinder REVOTRON turbo petrol motor, which is based on the XETA engine block, for use in the Zest and this engine is currently on display at malls in 15 cities across the country. The 1.2 liter petrol engine will come with a unique – for its segment – “Multi Mode” drive technology, which essentially offers three driving modes, City, Eco and Sport. The engine’s electronic control unit (ECU) will alter throttle responses for each mode, giving the driver a different feel. In India, such a feature is only available on luxury and sports cars. Another class leading feature on the Zest will be the automated manual transmission married to the 1.3 liter Fiat Multijet turbo diesel engine, which will make for the first diesel engined automatic, sub-4 meter car in the country and a best-in-segment feature for the compact sedan market. Tata Motors claims to have worked on improving quality all around, including that on the interiors of the Zest. Driving pleasure is another aspect that the Zest claims to be engineered to offer. The car will be followed by a hatchback sibling called the Bolt, which will be launched during the festive season.